Creamsicle is a flat bar of vanilla ice cream placed on a flat wooden stick and covered by a layer of flavored ice. 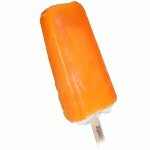 Creamsicle comes in various flavors including orange, lime, blue raspberry, grape, blueberry, and cherry. Orange and vanilla combo is considered the classic flavor combination. This frozen dessert is also known as 50-50 bar. It is available in several varieties including sugar free pops and 100 calorie bars. Creamsicle (particularly orange flavored) has inspired many desserts and beverages such as creamsicle pie, creamsicle layer cake, creamsicle pudding, creamsicle cupcakes, creamsicle smoothie and even creamsicle martini. All these recipes are based on a combination of cream and orange. National Creamsicle Day is the perfect occasion to relax on a hot August day. Sit back and indulge yourself with a delightful frozen treat. Just make sure to eat your Creamsicle quickly before it starts to melt. And don't forget to buy some Creamsicles for your family, too!